TBS: Your Instagram pics are fabulous – if you found that you could only save three, which three pics would you choose? SWD: The first picture I would save is one I recently posted; it was a thank you post for reaching 10k followers. I always like to say thanks when I hit a milestone with my followers as without them I wouldn’t be able to share my work with so many different people from all walks of life. I did something a little different with this photo; I took it after a busy and messy day painting, I’m making a peace sign with my hand and it’s covered in paint. The second post I would keep is one with four of the different surfboards I have painted all lined up next to each other. I really like this photo as it features some of my favourite works, and all of the surfboard artworks are different yet they still work nicely next to each other. I took this photo weeks before I posted it, at the end of NAIDOC week, after all, these boards had been on display at an event for Accor Hotels in Sydney. The third and final photo I would save is a nice simple black and white photo. It’s one which is taken as I’m halfway through painting a surfboard; I have my head down working away and the caption I put on this post is really fitting, I think: “There are no speed limits on the road to success.” I always love posting progress shots as it gives people a little insight into what I’m working on and seeing at that point in time. Getting to this point: Can you please tell The Big Smoke readers a little bit about yourself and how @saltwaterdreamtime came to be? I’m Zachary Bennett-Brook, a proud Torres Strait Islander man, born and raised in Wollongong, which is Dharawal country, home of the Wodi Wodi people. 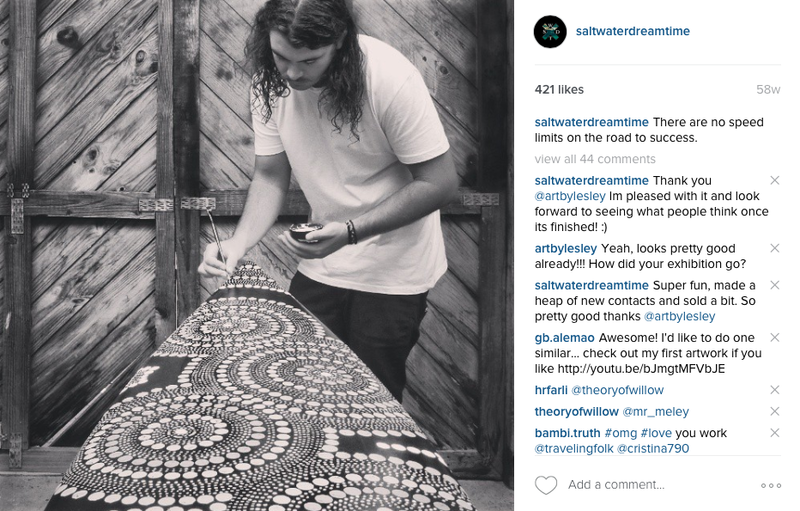 I am 25 years old, a graduate of the University of Wollongong with a degree in PDHPE teaching and more recently the founder, owner and craftsman of Saltwater Dreamtime. 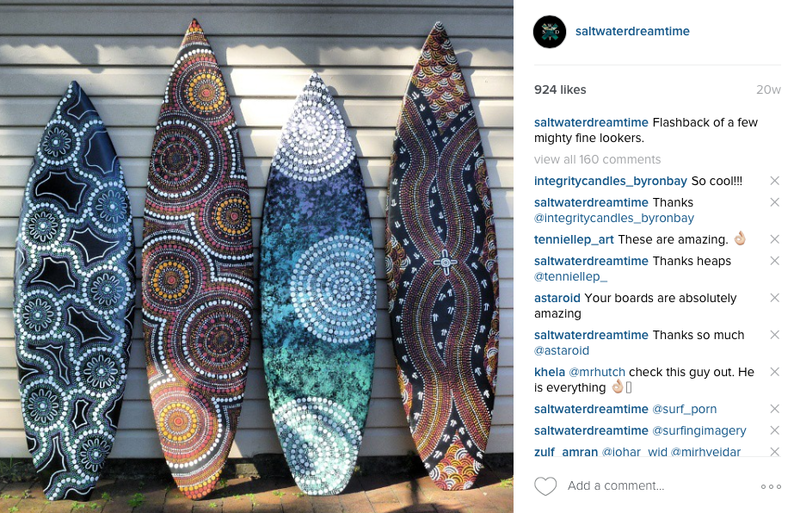 I create artwork, which combines my passion for surfing and the ocean infused with my Indigenous heritage. 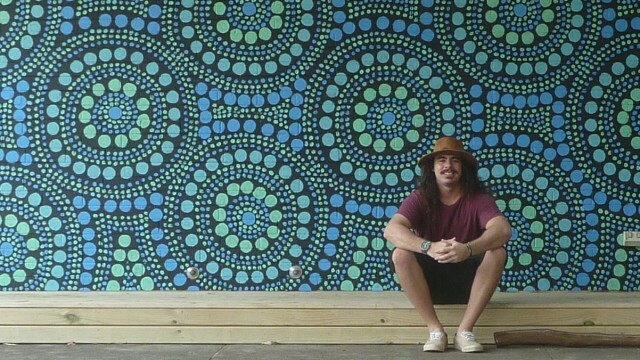 The artworks I design are often made from recycled surfboards and fins, putting a modern twist and my own unique touch on traditional Indigenous Australian art. To tell you the truth I don’t really know. My work is often quite bright and detailed with evident themes of the ocean infused with my heritage, which always lights up people’s days. I guess that one of the reasons people follow my work could be to brighten up their newsfeed with vibrant and unique works where you can see my passion shining through. Through the images I post I like to give people a little bit of an insight into my daily life, paintings and what I get up to, as I usually have a few things going on. A lot of the photos I post either contain paintings I have finished or works I’m currently completing. 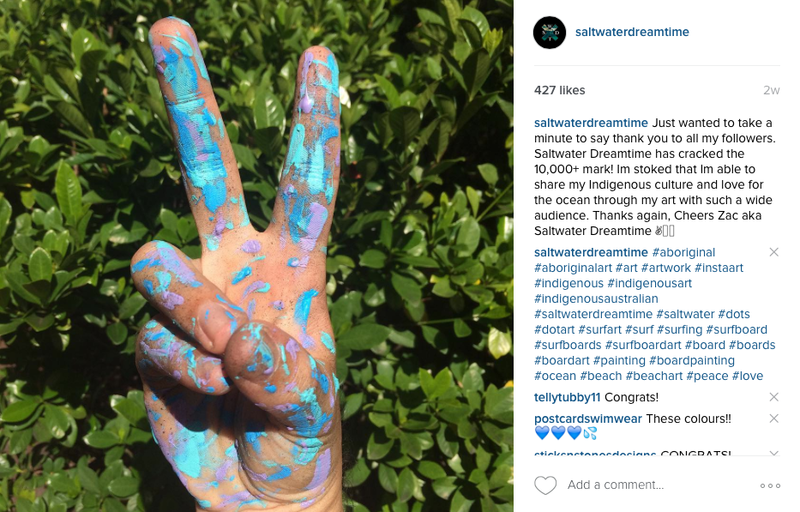 I guess the story I’m trying to share is my journey with Saltwater Dreamtime and the adventures I have. I guess the worst way is when people straight up copy your work. 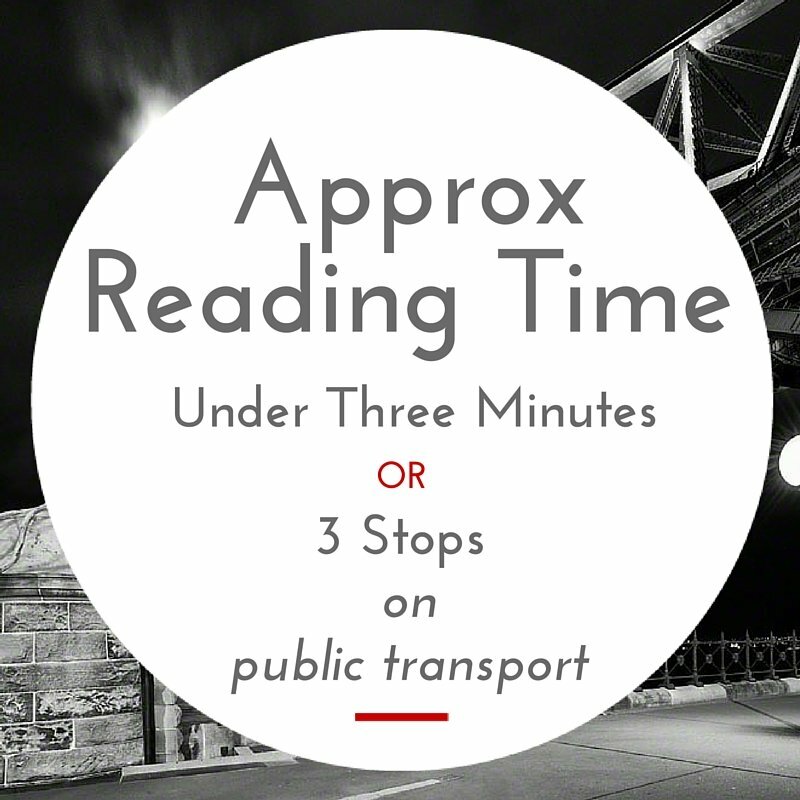 I’m always really open to sharing my knowledge, and provide tips I have learnt along the way. But copying another person’s work is never cool! The best way to get my attention is just to write me a comment or flick me a DM, pretty simple. I always try to write back to people straight away. I think it’s sweet when you comment on someone’s work you admire or look up to and they reply. Zachary Bennett-Brook is a proud Torres Strait Islander man, born in Wollongong Dharawal Country. He has a love for the ocean as a keen surfer and Saltwater man, and he infuses his culture and passions together. Being a Torres Strait Islander, water has always played a vital role throughout his life, as it is ingrained in his cultural heritage and is often represented throughout many of his artworks and designs. His ambition is to create and develop works, which are engaging and aesthetically appealing, whilst growing artistically and professionally.